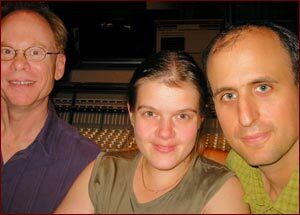 E3Q is a trio comprised of University of Michigan (U-M) faculty members Dr. Katri Ervamaa (‘cello), Dr. Michael Gould (percussion) and Dr. Mark Kirschenmann (trumpet and electronics). The trio was founded at the U-M Residential College (RC). Because the RC is located in the U-M’s East Quadrangle, the ensemble took the name E3Q. At the RC, Dr. Katri Ervamaa teaches chamber music, Dr. Michael Gould teaches Afro Cuban drumming and a course in ‘found’ instruments, and Dr. Mark Kirschenmann teaches creative improvisation, composition, and theory. Drs. Gould and Kirschenmann also teach for the Department of Jazz and Improvisation at the School of Music, Theatre & Dance. E3Q made their public debut at the Ann Arbor Edgefest in October 2005. Katri Ervamaa, DMA (‘Cello) has performed widely in the US, as well as in her native Finland and throughout Europe. As a member of the Owla String Quartet, Katri appeared on Bowdoin, Soundfest, Orlando, Norrtälje, Lyckå, Haut Limousin, St.Foi de Grand and Kuhmo Festivals, as well as in recitals in Finland, the Netherlands, Germany, France, England, Sweden, Taiwan and the US. She is a founding member of Brave New Works contemporary music group, Ed Sarath's Timescape, a nine–member free improvising group, as well as the newly founded Muse String Quartet. Katri holds the Bachelor of Music and Master of Music degrees from the Northern Illinois University and the Doctor of Musical Arts degree from the University of Michigan. Her principal teachers include Erling Blöndal Bengtsson, Marc Johnson, Kazimierz Michalik, and Lauri Laitinen, as well as Andrew Jennings and the Vermeer and Borodin String Quartets. Michael Gould (Percussion) is an Associate Professor of Music at the University of Michigan, and has received international recognition as a performer and scholar in the field of contemporary percussion performance and pedagogy. Having served for several years as percussion specialist at Huis Ten Bosch European resort in Nagasaki, Japan, Michael has performed with leading artists and performing groups from around the world. He has also taught at Semaine Musicale in Amiens, France, Piteå Conservatory, Sweden, the Tampico International Percussion Festival in Mexico and served on the faculty of Bands of America-World Percussion Symposium. Michael has toured nationally as percussionist/drumset specialist with the performing group the Dallas Brass and can also be heard on the Seabreeze label with jazz artist Miles Osland. He is the founder of the quartet CASHEW. He has recorded two of his own CD´s, Michael Gould2 and CASHEW. Michael is a performing artist for Zildjian cymbals, Yamaha Drums and Percussion and Innovative Percussion. He is also currently the chair of the College Pedagogy Committee for the Percussive Arts Society. Mark Kirschenmann, Ph.D, is a versatile composer and trumpeter. Much of his work explores the confluence of composition, performance and improvisation. Mark has an ongoing commitment for composing and performing with his MIDI/electric trumpet, which has been hailed by the likes of Anthony Braxton, Rob Mazurek, and Mark Isham. In 2005 he released the solo recording This Electric Trumpet on his Sonikmann Records label. Mark has performed in major venues of New York City (Tonic, Knitting Factory, Bowery Poetry Club) and Chicago (Hot House and Empty Bottle). His music is also performed by others throughout the U.S and Europe: recent premieres include his Song of Solomon (Bible Chapter 1-3) for soprano and two cellos in New York, and Metamorfooseja Paavon virrestä for five cellos in Finland. An accomplished writer, the All Music Guide has published many of his record reviews. Mark holds degrees in composition from Carnegie Mellon University (B.F.A. ), the Eastman School of Music (M.A. ), and the Ph.D. in Composition and Music Theory from the University of Michigan, where he is currently an Adjunct Assistant Professor for the Department of Jazz and Improvisation, the Residential College, and directs the Michigan Youth Jazz Improvisation program. E3Q's music is available for purchase from the iTunes Music Store. Previews of all selections are also available in the BlockM Records catalog.